The history of the 20th century is alive and well in the era's fictional recountings. These 26 novels and video adaptations reveal the truth and turbulence that will resonate among avid readers. WHETHER THEY CHOOSE to visit "belowstairs," the bloody trenches of World War I, or one of Moscow’s grand hotels just after the Russian Revolution, readers who pick up a historical novel set in the 20th century know that even a brief immersion in the past will give them plenty to reflect on about the world today. The most recent period that qualifies as "historical fiction" (defined here as books set 50 or more years in the past not written by an author with firsthand experience of the period), the 1900s were marked by immense scientific and technological progress and also unimaginable violence, hatred, and bloodshed. For a ­modern-day reader, titles set during this time offer some sense of escape even as they address still-relevant issues. Despite a recent surge in World War I and World War I–adjacent fiction (thanks to the success of Downton Abbey and the centennial of the Great War), World War II continues to dominate; it is the most popular setting for historical fiction set in the 20th century. Best sellers such as Kristin Hannah’s The Nightingale and Anthony Doerr’s All the Light We Cannot See present stories of civilian experiences of resistance and loss in contrast to those set on the battlefield. Our continued efforts to grapple with the legacy of the Holocaust have kept concentration camp narratives popular as well. Affinity Konar’s Mischling and Heather Morris’s The Tattooist of ­Auschwitz are recent successful examples of this subgenre, delivering new perspectives with real-life Holocaust ­narratives as inspiration. Though not quite as popular as they once were, fast-moving suspense and tales of espionage and high-stakes diplomacy such as Robert Harris’s Munich also attract many devotees. 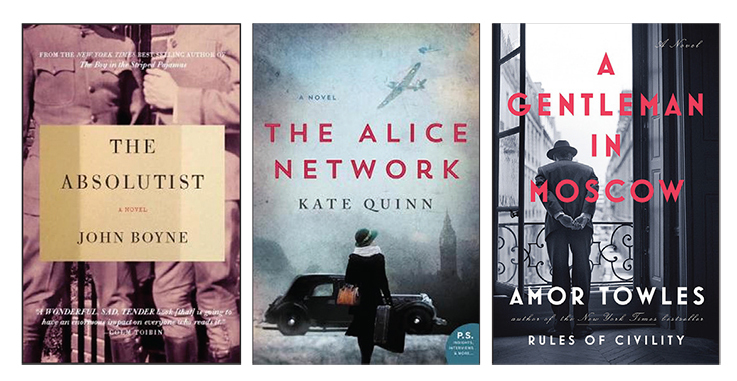 One of historical fiction’s strengths is its ability to allow readers to experience history through fresh eyes and provide vivid new perspectives. The 20th century’s dramatic march of social change creates particularly fertile sources for works highlighting women resisting society’s restrictive and stifling expectations. Novels featuring the wives and daughters of famous individuals have become an important subgenre. Paula McLain’s The Paris Wife, featuring Ernest Hemingway’s long-suffering first wife, Hadley, is just one example of a hugely successful novel in this vein. Nonwhite and non-Western perspectives are crucial to a well-rounded historical fiction collection. Librarians looking for culturally diverse historical fiction titles should also be particularly careful to include a variety of "own voice" ­accounts. Any assessment of past titles for weeding must always include a critical consideration of the novels’ treatment (or omission) of racial and ethnic groups. In addition to reviews and catalogs, librarians will find websites particularly valuable in discovering new historical fiction. Though somewhat infrequently updated, ­Historicalnovels.info is a comprehensive listing of more than 5,000 titles sorted by time period and setting, very helpful when filling holes in a collection or locating intriguing backlist works. The Historical Novel Society (­historicalnovelsociety.org), which has promoted historical fiction for over 20 years, regularly lists forthcoming books along with articles and almost 18,000 reviews. This is a particularly good resource for releases from smaller publishers that might otherwise be missed; its lengthy list of reviews can be filtered by period or century. Below is a compilation of historical novels set in the 20th century that represent some of the best the genre has to offer, with particular attention paid to including a diverse mixture of settings and protagonists. Starred titles ( ) are essential for most collections. Bracht, Mary Lynn. White Chrysanthemum. Putnam. 2018. 320p. ISBN 9780525497653. $26; ebk. ISBN 9780735214453. Dueñas, Maria. The Time in Between. Atria. 2011. 624p. ISBN 9781451616880. $26; ebk. ISBN 9781451616903. Ford, Jamie. Hotel on the Corner of Bitter and Sweet. Ballantine. 2009. 304p. ISBN 9780345505330. $26; ebk. ISBN 9780345512505. Gross, Andrew. The One Man. Minotaur: St. Martin’s. 2016. 432p. ISBN 9781250079503. $26.99; ebk. ISBN 9781466892187. Hunter, Georgia. We Were the Lucky Ones. Viking. 416p. ISBN 9780399563096. pap. $16; ebk. ISBN 9780399563102. Kelly, Martha Hall. Lilac Girls. Ballantine. 2016. 487p. ISBN 9781101883075. $26; ebk. ISBN 9781101883068. Boyden, Joseph. Three Day Road. Viking. 2005. 354p. ISBN 9780670034314. $23.95; ebk. ISBN 9781101078174. Boyne, John. The Absolutist. Other. 2012. 320p. ISBN 9781590515525. pap. $19.95; ebk. ISBN 9781590515532. Cash, Wiley. The Last Ballad. Morrow. 2017. 384p. ISBN 9780062313119. $26.99; ebk. ISBN 9780062313133. Church, Elizabeth. The Atomic Weight of Love. Algonquin. 2016. 352p. ISBN 9781616204846. $25.95; ebk. ISBN 9781616206116. Corthron, Kia. The Castle Cross the Magnet Carter. Seven Stories. 2016. 800p. ISBN 9781609806576. $32; ebk. ISBN 9781609806583. Darznik, Jasmin. Song of a Captive Bird. Ballantine. 2018. 416p. ISBN 9780399182310. $27; ebk. ISBN 9780399182327. Dyer, David. The Midnight Watch: A Novel of the Titanic and the Californian. St. Martin’s. 2016. 336p. ISBN 9781250080936. $26.99; ebk. ISBN 9781466893085. Lee, Min Jin. Pachinko. Grand Central. 2017. 496p. ISBN 9781455563937. $27; ebk. ISBN 9781455563913. McFadden, Bernice L. The Book of Harlan. Akashic. 2016. 352p. ISBN 9781617754456. $32.95; ebk. ISBN 9781617754548. McNees, Kelly O’Connor. Undiscovered Country: A Novel Inspired by the Lives of Eleanor Roosevelt and Lorena Hickok. Pegasus. 2018. 336p. ISBN 9781681776798. $25.95; ebk. ISBN 9781681777276. Massey, Sujata. The Widows of Malabar Hill. Soho Crime. 2018. 400p. ISBN 9781616957780. $26.95; ebk. ISBN 9781616957797. Pollock, Donald Ray. The Heavenly Table. Doubleday. 2016. 384p. ISBN 9780385541299. $27.95; ebk. ISBN 9780385541305. After their father unexpectedly dies on their Southern farm, the three Cane brothers, inspired by reading a particularly violent dime novel, turn to a life of crime that takes them north to Ohio. Pollock’s dark humor makes this gothic story a pleasure to read even at its most depraved. Quinn, Kate. The Alice Network. Morrow. 2017. 528p. ISBN 9780062654199. pap. $16.99; ebk. ISBN 9780062654205. Towles, Amor. A Gentleman in Moscow. Viking. 2016. 462p. ISBN . $27; ebk. ISBN 9780399564048. Weisgarber, Ann. The Personal History of Rachel DuPree. Viking. 2010. 336p. ISBN 9780143119487. pap. $17; ebk. ISBN 9781101190364. The Crown: Season One. 600 min. Netflix. 2017. DVD UPC 043396507104. $30.99; Blu-ray UPC 043396507050. $40.99. Fans of royal intrigue will devour this look behind the scenes of the early reign of Elizabeth II. Season 2 is running now, and Season 3 was just cast. A French Village: Season 1. 700 min. Mhz Networks. 2015. UPC 815047018747. $39.95. Generation War. 279 min. Music Box Films. 2014. DVD UPC 741360538368. $29.99; Blu-ray UPC 741360538443. $34.99. This German miniseries relates the stories of five friends who find themselves torn between loyalty to their homeland and horror at the Nazis’ crimes. Peaky Blinders. 360 min. BBC Warner. 2015. DVD UPC 883929422906. $29.99. An ambitious gangster family in 1919 Birmingham, England, try to move up in the world while evading the law.